The membership of SCAR currently comprises 43 National Members and 9 Union Members. Following the conversations over the last couple of years, two (2) new countries have expressed interest in applying for membership for this Delegates meeting. Only one application has been received to date. Increasing the membership of SCAR has obvious advantages, both by engaging more countries in Antarctic Science and SCAR as well as increasing SCAR revenues. With regard to current membership, those associate members that have already consolidated Antarctic research activities should be encouraged to become full members. Currently Venezuela is in arrears for more than 2 years and Delegates should consider the situation as no correspondence has been received for those 2 years. 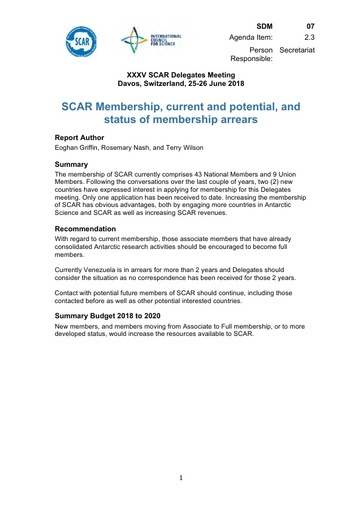 Contact with potential future members of SCAR should continue, including those contacted before as well as other potential interested countries. New members, and members moving from Associate to Full membership, or to more developed status,would increase the resources available to SCAR.